I've just returned from the 33rd Degree conference and I simply need to share the positive energy I've brought home with me. First of all - a fantastic surprise! I've been kind of skeptical about Dr Venkat Subramaniam which I should never ever, ever EVER have been to. This was one of the most brilliant, encouraging, humorous and inspiring talks I've ever seen on polyglot programming! Venkat, I hope you'll not forget your exercises again :) That was an absolutely brilliant metaphor to TDD. In overall it was the best source of ideas to encourage people to learn I've ever encountered! Best talk of the conference in my opinion! There was also the best polish speaker, Sławek Sobótka with his deep-zoom like presentation about layers in CqRS architecture. Sławek: you rock! And pleeeease! Don't put the architect label on t-shirt :) Don't ever turn over to the dark side! I must also say there was one talk that threw me completely out of balance. That was the talk by Dierk Koenig about ULC (by Canoo) framework. To give you a little bit of background here I'll tell you this: I'm usually fond of "pure" solutions. This means that mixing Flex/Flash, Silverlight or desktop Java with web development doesn't seem like a good idea to me. There's tons of stuff that you can use HTML5 for and you don't need any extras on top of the browser to make things work. That's the main reason I'm such an advocate of jQuery, its UI framework and above all the Ext JS library. Nevertheless the ULC framework by Canoo has proven itself to be a viable alternative to plain-browser design in cases where more sophisticated interoperability with client's environment is required. That includes for example interoperability with peripherals other than localStorage, sessionStorage and the other ones provided by default by HTML. Dierk also gave a very nice and pretty advanced talk on programming in Groovy (my favorite language!). Great stuff! And very very inspiring! Hamlet D'Arcy gave talked about ways to remove boiler plate code from your sources so that you can write more conscious code. Really good stuff, man! Thanks for the enlightenment! And thanks for bringing Groovy to the mix :) Groovy rocks! I've also had the opportunity to exchange some thoughts with Hamlet about the applicability of the ULC toolkit. He's been extremely helpful in helping me understand the business needs this toolkit tries to address. Thanks for sharing! If you're into the psychology kind of things then you're absolutely bound to visit Nathaniel Schutta's talk about hacking your brain. Man, that was really awesome to see so obvious and ridiculously simple ideas put into familiar context to which I could relate as a simple developer. And last but not least: if you're into "the latest and the greatest", or in other words if you're like me striving to make your other colleagues look corny, then the talk that Jarek Pałka gave on NoSQL databases and their applicability in solving certain challenges was definitely the one to be at. Jarek is known for his specific humor and to-the-point observations he makes. This time was no different and quite frankly I've expected nothing less from this guy. Great appearance, man! Overall this was a time very well spent. I encourage you to visit this conference next year - you'll be absolutely amazed! I'd also like to congratulate Grzegorz Duda, the mastermind behind all of this on putting together by far the best conference ever! Cool man, glad you liked the talk. It is a new one for me and still a work in progress. 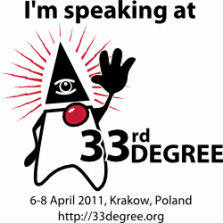 ... Hope to see you at GeeCON next month, there is a Hackergarten there as well.